The contribution that faith groups are making to wellbeing in Lambeth was celebrated at a special evening event as part of Inter Faith Week (November 15-21) at Lambeth Town Hall. Lucy Smith, Public Health Manager – Mental Wellbeing, Lambeth & Southwark and Juney Muhammad, Mental Health Promotion Team, South London & Maudsley NHS Foundation Trust (SLaM), (pictured) made a great team exploring what we can do to increase our wellbeing and that of the people around us and highlighting how spirituality and pastoral care in mental health is increasingly important. The event was chaired by the Canon of Lambeth, the Rev Canon George Ansah, who is soon to be the new Chair of Faiths Together in Lambeth. The message that came over is that faith groups play an important role in recognising when people in their community might need additional support; that they are the ones that walk alongside people when they are at their most vulnerable and help give people the will to ‘bounce back’. Also that it is those involved in faith groups – and there were many represented at the event – that can help forge other partnerships to help make communities more resilient. Among the many interesting stalls at the event were Southwark & Lambeth INTEGRATED CARE asking the community to develop outcomes that matter for health and social care. You can have your say at a public event on Monday 24 November, 6-8.30pm, at Inspire at St Peter’s, Liverpool Grove, SE17 2HH. 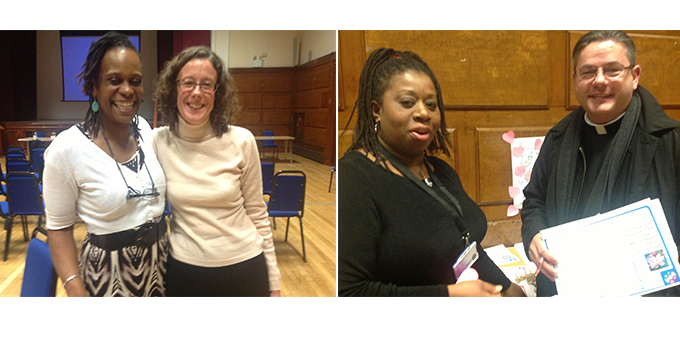 Also present were Councillors Marcia Cameron (Tulse Hill ward) and Jacqui Dyer (Vassall ward). Jacqui is Co chair of Lambeth’s Black Health and Wellbeing Commission and was promoting the Commission’s report From Surviving to Thriving at the event. Click here to read more about the report. Click here for more information about the Spiritual and Pastoral Care Course in Mental Health for all faith groups, which is run by SLaM. Pictured above right: Father Adrian McKenna from Corpus Christi RC Church, Brixton and Olive Lewis from SLaM.